And she looks like she is really enjoying it too. I'm going to have to get the girls one of those for sure. Soooo cute!!! I love the cherries on her shirt and the beautiful background with the fence. LOVELY and CUTE overload!! (Also, nice and sharp)! So cute! That is a great take on bright & vivid. I bet she was so happy - that is one big lolly! So did she finish it all? Awww. So sweet. I love it. I LOVE those lollipops..they are bright, and BIG and fun :) very cute photo! how could she not love that beautiful lollipop! such a cutie! She is so sweet, lovely bokeh! Great colors in the lollipop and pretty bokeh. That looks so good! She's so cute! Oh, what a little doll. beautiful shot! Love this. Her skin is so clear, the colours delightful and I love how the wind is playing with her hair. Who wouldn't be happy to have a lollipop as big as one's head! :-) Beautiful background and I love the wind blowing her hair! Cute! I love her outfit too. Darling! Oh, this is too perfect for the theme! 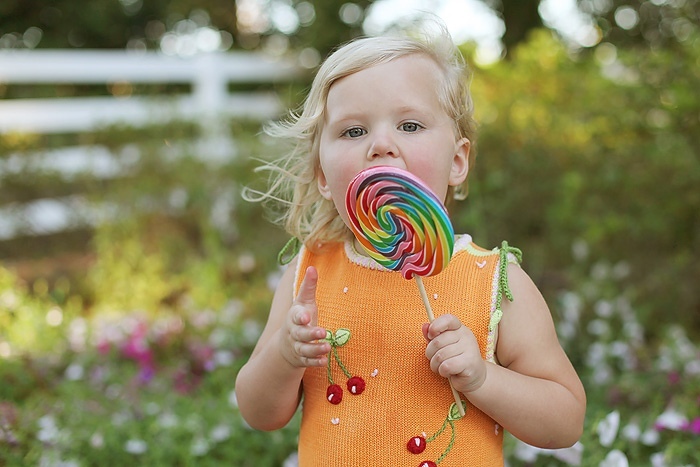 I love all the colors, that beautiful shirt, the lollipop, and the sweet girl!